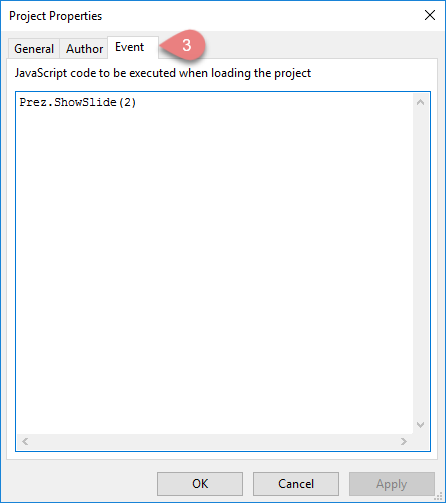 Adding Custom Script - Atomi Systems, Inc.
ActivePresenter allows you to write custom script in three areas in three contexts which are Project, Slide and Object context which I will describe below. Write your script to execute in the box. Click on the slide in the Slide Organization Panel to select it. 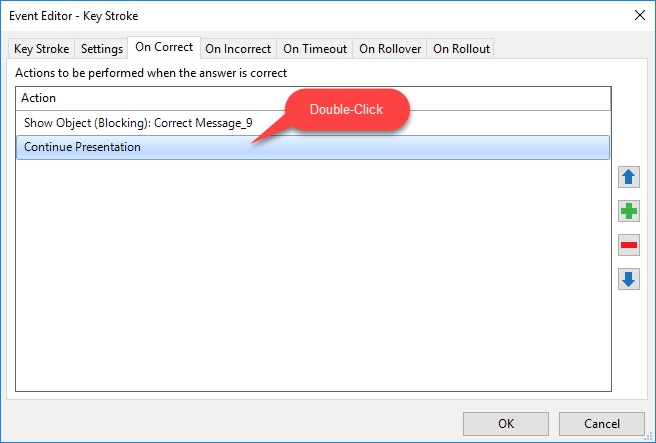 Select tab(s) that you want to write the script for form the On Correct, On Incorrect, On Incomplete or On Timeout tab. Open the Edit Action window by double clicking on it the action type. 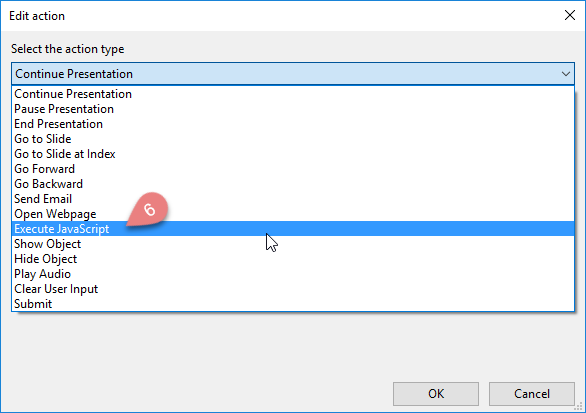 You can access the presentation by using the global object Prez which is a global object which has following methods applying for Project context, Slide context and Object context. 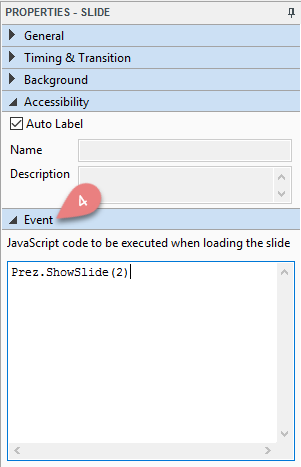 ShowSlide(index): Go the slide which has the specified index. The index of the first slide is 1. ShowNextSlide(): Go the next slide. ShowPreviousSlide(): Go to the previous slide. ShowPreviousVisitedSlide(): Go to the previous slide of the current point in the navigation history stack. ShowNextVisitedSlide(): Go to the next slide of the current point in the navigation history stack. GetSlide(): Return the current slide. GetObject (object name): Return the object in the current slide which has specified name. SetText(text): Change text for objects. For example, you can change the text inside a shape, a text box, etc. GetText(plaintext): Return a string represents the text of the object. Show(show): Show or hide the object in which “show” is a Boolean determining whether to show or hide the object. IsShown(): Check if the object is shown or hidden. SetPosition(x, y): Set the position of the object in which “x” is the horizontal position and “y” is the vertical position. 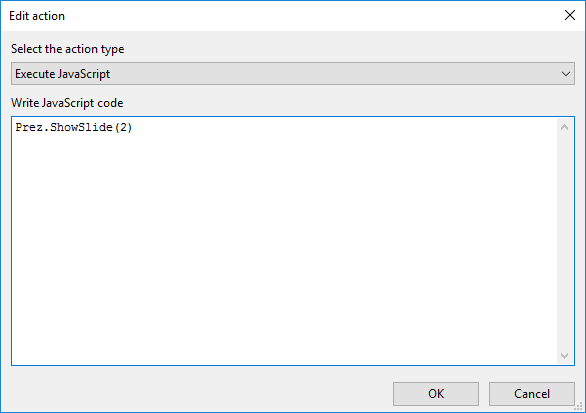 That’s how to add custom script in ActivePresenter. Let’s try it today and feel free to contact us if you need any support.